A tiny part of the fluorescence light is captured by the fiber core and propagates together with any pump and signal along the fiber (in both directions). Importantly, it can then experience a similar gain as any signal. As fiber amplifiers often reach a high gain (tens of decibels), the guided part of the light from spontaneous emission is strongly amplified. We call that amplified spontaneous emission (ASE). The resulting power can become much larger than the power radiated into all other directions, even though only a minor part of the fluorescence is captured by the core. We may obtain a substantial output power in any wavelength region where the amplifier gain is high, even if we do not inject any input signal. That ASE light is relatively broadband; it is actually used in some superluminescent sources. If ASE copropagates with a signal, it constitutes a broadband noise for that signal. Strong ASE can cause substantial gain saturation: via stimulated emission, it lowers the excitation density and thus the amplifier gain. It causes a kind of soft gain clamping: more pump power still increases the gain, but only slightly, as the ASE powers grow rapidly with increasing gain. Note that the gain clamping by ASE is most unwelcome when we need to amplify signals at wavelengths far from the gain maximum. Essentially, ASE limits the peak gain, and our signal gain may be much weaker than that. There are even cases where a device cannot work at all because of ASE. 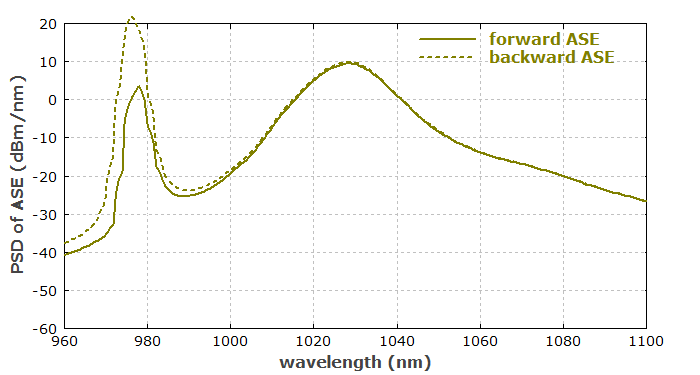 For example, it is not easy to make efficient high-power ytterbium-doped fiber lasers emitting at 975 nm, because it can be hard to suppress ASE at longer wavelengths. A similar case for an amplifier is shown in part 6 of this tutorial. What Determines the Strength of ASE? A critical factor for ASE is the amount of amplifier gain. As a rule of thumb, ASE becomes substantial above roughly 30 dB. We can still achieve signal gains of the order of 40 dB in a single amplifier stage, but usually not much more than that. The more guided modes a fiber has, the more fluorescence light can be captured, and the stronger will be ASE. The minimum possible amount of ASE is obtained for a single-mode fiber. Basically all low-power fiber amplifiers are based on single-mode fibers, whereas high-power devices often have a few-mode fiber, exhibiting stronger ASE. For laser-active ions with quasi-three-level behavior (see part 3), ASE is significantly enhanced (normally by a few decibels). This is because we need a higher excitation density for a given amount of gain in order to overcome the signal reabsorption, and that causes stronger spontaneous emission. That effect is particularly pronounced for ASE in a direction where the excitation density at the beginning of the fiber is low. Therefore, ASE is often stronger in a direction opposite to that of the pump. As an example, we consider an ytterbium-doped single-mode fiber pumped with 500 mW at 940 nm. No signal is injected. Figure 1 shows that a substantial ASE power results in forward direction, and even more in backward direction. ASE has a pronounced impact on the Yb excitation density, which reaches it maximum not where the pump is strongest (at the left end), but rather approximately where ASE is weakest. Due to the resulting evolution of excitation density, the pump power decays in a somewhat irregular fashion: first quite fast, than more slowly, then faster again. Figure 1: Optical powers of pump and ASE along the length of an ytterbium-doped fiber amplifier. 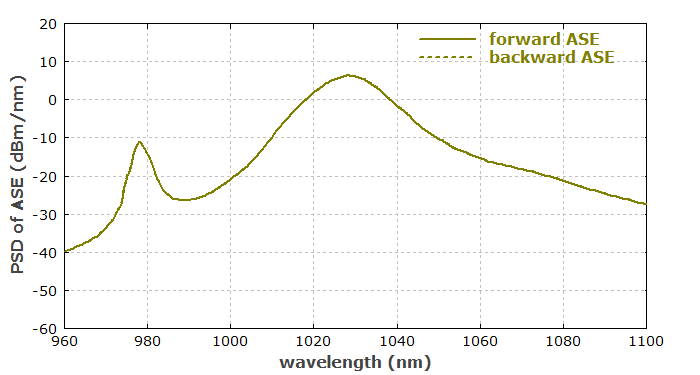 Figure 2: ASE spectra at both ends of a fiber amplifier. In the last third of the fiber length, the excitation density is below 50%, and there is net absorption at 975 nm. Forward ASE is strongly attenuated in that region, and only long-wavelength ASE makes it to the end. Figure 3: Same as Figure 1, but with a logarithmic power scale. ASE between 970 nm and 980 nm has been shown separately in addition. Backward ASE, starting at the right fiber end, continuously grows even in the region of negative net gain. (This is also true for the 975-nm part of the ASE, which has been plotted separately in addition.) Therefore, backward ASE can start at a much higher level once it gets into the region with positive net gain. On the other hand, forward ASE around 975 nm is strongly attenuated towards the end. The fiber's gain at 1030 nm has been found to be 44 dB. Of course, ASE is the limiting factor. (In a theoretical situation without any ASE, one could have 76 dB in the configuration, and even more for a longer fiber.) 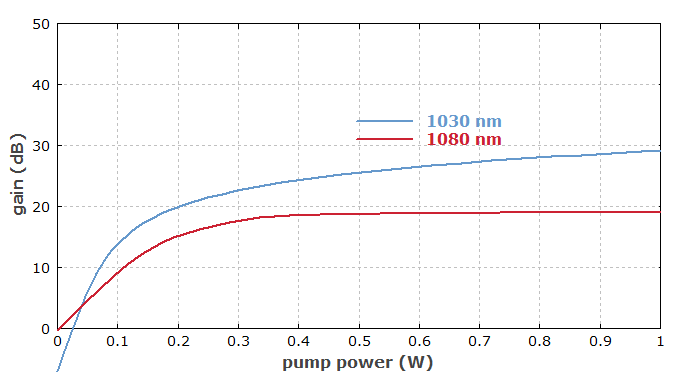 Figure 4 shows how the small-signal gain at two wavelengths depends on the pump power. Already above 100 mW pump power, ASE starts to reduce it. 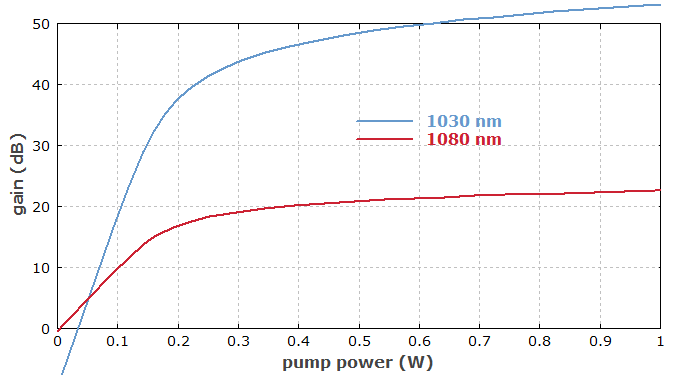 Figure 4: Dependence of the small-signal gain at 1030 nm and 1080 nm on the pump power at 940 nm. The ASE behavior can strongly change if we change the pump wavelength. As an example, let us pump the same fiber as before, but at 975 nm instead of 940 nm. In that case, there can never be net gain at 975 nm, as stimulated emission by the pump limits the excitation density to roughly 50%. 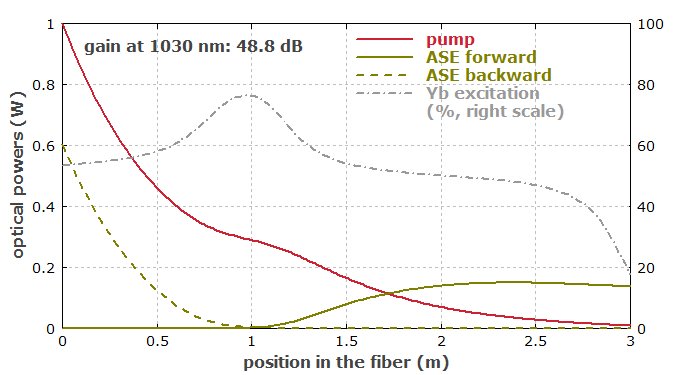 Figure 5: Optical powers of pump and ASE along the length of an ytterbium-doped fiber amplifier. 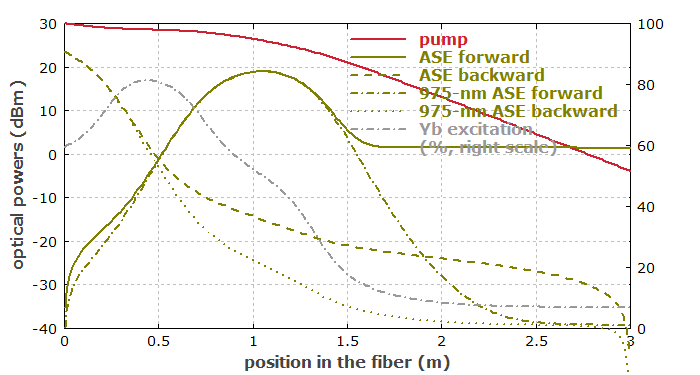 It might be very surprising that pump power can now no longer be fully absorbed in the 3 m of fiber, although the absorption cross section at 975 nm is much higher than at 940 nm. This phenomenon is not due to ASE; it occurs also for lower power levels where ASE is weak. The reason is stronger pump saturation for 975 nm. The perhaps best way to understand it is to consider that the energy of absorbed pump light must be dissipated via spontaneous emission; the Yb ions have no other way to get rid of that energy, and can on average only absorb as many photons as they can radiate away. The lower excitation density achieved with 975-nm pumping (due to strong stimulated emission) implies that less energy is radiated per centimeter of fiber, and less pump power can be absorbed. A less important factor is that 975-nm photons have a lower energy, so you get more of them for the same power. Figure 6: Optical powers of pump and ASE along the length of an ytterbium-doped fiber amplifier. The 975-nm peak is still there, but it is much weaker, as it does not see a positive net gain anywhere in the fiber. Figure 7 shows again the dependence of 1030-nm gain on pump power. Figure 7: Dependence of the small-signal gain at on the pump power at 975 nm. 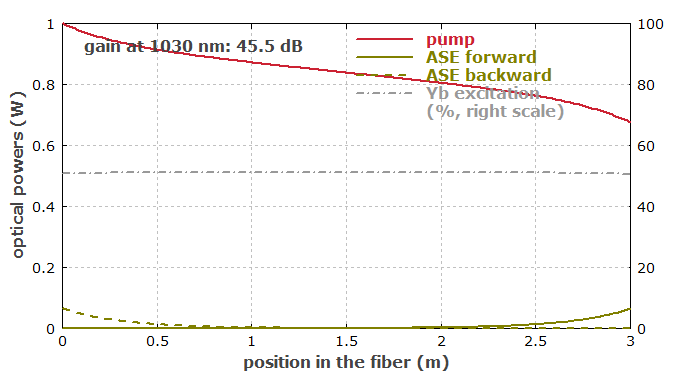 Figure 8: Same as Figure 7, but with a longer fiber length: 4 m instead of 3 m.
Interestingly, for 200 mW pump power the longer fiber delivers less gain at 1030 nm than the shorter fiber. For the 1080-nm gain, this is not the case. The stronger reabsorption at 1030 nm is behind that. The easiest is to limit the peak gain. We should use a single-mode fiber rather than a multimode fiber. A polarizing fiber, where light only with one linear polarization direction is guided, would be even better, if the signals to be amplified are polarized. If our laser transition has a quasi-three-level nature (as usual in fiber amplifiers), we should keep the excitation density at both ends as high as possible. In the next part, we will see that backward pumping may be better than forward pumping. It can also be very helpful to use an amplifier chain consisting of two or more amplifier stages, and to filter out ASE in between the stages. Go to Part 5: Forward and Backward Pumping or back to the start page.